Thanks Roger. Eastbourne’s sporting community has been numb with shock and sadness for a fortnight now, and there will be a huge gathering on Friday, September 28 (2pm) at St Mary’s Church Willingdon to honour Roger Addems and to support his family in their loss. How often do we fail to recognise people until we suddenly lose them? Roger filled a hundred and one roles at the Saffrons and beyond: he oversaw and implemented plans great and small, with wisdom and good humour and integrity. Others might be talkers, but Roger was a doer. Modest, down to earth and with little time for airs and graces, and never seeking the glory or the reward. We always chuckled about the Two Rogers: I last chatted to Roger A and Coops on the sidelines of a Borough versus Town friendly in pre-season. They never quite had the repartee and comic timing of the Two Ronnies, but they were better value any day for a natter about sport, and their beloved Town in particular. The Saffs will always be part of the fabric of this lovely town of ours, and Roger Addems was part of its fabric. “If you seek his monument, look around you.” Thanks, Roger. Danny to Dan...Veteran Langney Sports followers, from a couple of decades back, will remember him well – a neat, intelligent right-sided attacker with a zippy turn of pace. Danny Ashworth served the Sports well before moving on to higher things – all the way to the top, in fact, as the FA Technical Director. Now, as a crisper and more executive Dan Ashworth, he plans to leave his influential post at the FA to take up a similar role at Brighton and Hove Albion. A good time to renew the links and friendships? Welcome back to Sussex Danny. Matty to where? Meanwhile, a neat, intelligent left-sided attacker is also moving on. Matt Crabb, one of the Sports’ all-time greatest servants, has left his coaching role at Langney Wanderers. And without any harsh feelings, I hope. Perhaps they were never an exact match, and certainly it’s a chance for Wanderers to re-group and re-assess, after a challenging start to life in the higher division. Crabby regains a bit of time for family and fishing, but let’s hope that his lifetime of football experience and wisdom will be available on a touchline somewhere soon. One of the genuinely good guys. Happy birthday Harry...He looks and plays beyond his years, but Harry Ransom turns nineteen next week. 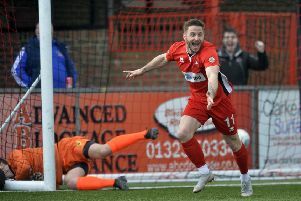 Thoughtful, courteous and grounded (except when he’s jumping for headers), the Sports centre-back is surely a role model for every one of the 450 youngsters who pull on their Borough shirts or training kit each week. We chatted on the way back from the FA Cup win at Brantham. “I still learn something new from every game. If young Ransom’s future career takes him higher, nobody will be surprised; but all in good time. “I just take my football week by week.” It’s a cliché, but in Harry’s case it is entirely true. Happy birthday, young man!